For intuition about EVT, consider the storm-time disturbance (Dst) index introduced in the last post, which represents the average depression in the magnetic field at the surface of the earth at low latitudes. You can download the Dst for every hour since 1957: half a million data points and counting. I took this data set, split it randomly into some 5,000 groups of 100 data points, averaged each group, and then graphed the results. 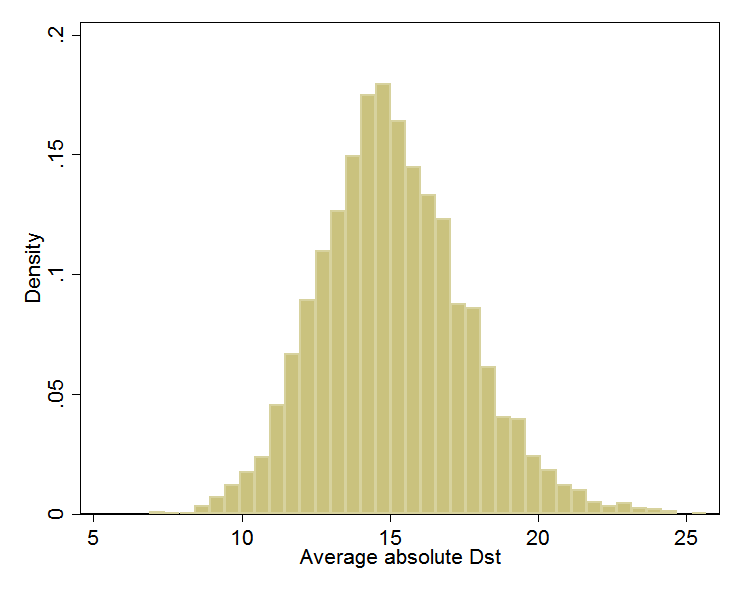 Knowing nothing about the distribution of hourly Dst—does it follow a bell curve, or have two humps, or drop sharply below some threshold, or a have long left tail?—I was nevertheless confident that the averages of random groups of 100 values would approximate a bell curve. A cornerstone of statistics, the Central Limit Theorem, says this will happen. Whenever you hear a pollster quote margins of error, she is banking on the Central Limit Theorem. Exponential. Suppose we define a “storm” as any time Dst exceeds 100. 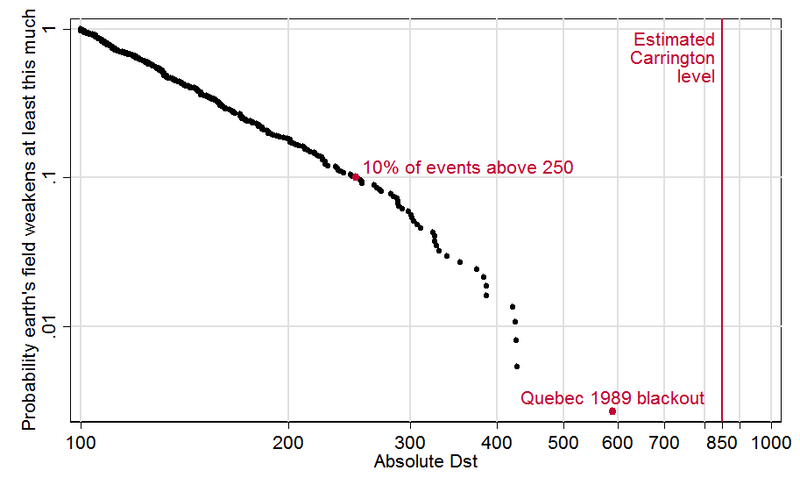 If storms are exponentially distributed, it can happen that 50% of storms have Dst between 100 and 200, 25% between 200 and 300, 12.5% between 300 and 400, 6.25% between 400 and 500, and so on, halving the share for each 100-point rise in storm strength. The decay toward zero is rapid, but never complete. As a result, a storm of strength 5000 (in this artificial example) is possible but would be unexpected even over the lifetime of the sun. And it happens that the all-time average Dst would work out to 245. In my full report, I review studies that use statistics to extrapolate from the historical record. Two use EVT (Tsubouchi and Omura 2007; Thomson, Dawson, and Reay 2011), and thus in my view are the best grounded in statistical theory. However, the study that has exercised the most influence outside of academia is Riley (2012), which estimates that “the probability of another Carrington event (based on Dst < –850 nT) occurring within the next decade is 12%.” 12% per decade is a lot, if the consequence would be catastrophe. “1 in 8 Chance of Catastrophic Solar Megastorm by 2020” blared a Wired headline. A few months after this dramatic finding hit the world, the July 2012 coronal mass ejection (CME) missed it, eventually generating additional press (see previous post). “The solar storm of 2012 that almost sent us back to a post-apocalyptic Stone Age” (extremetech.com). 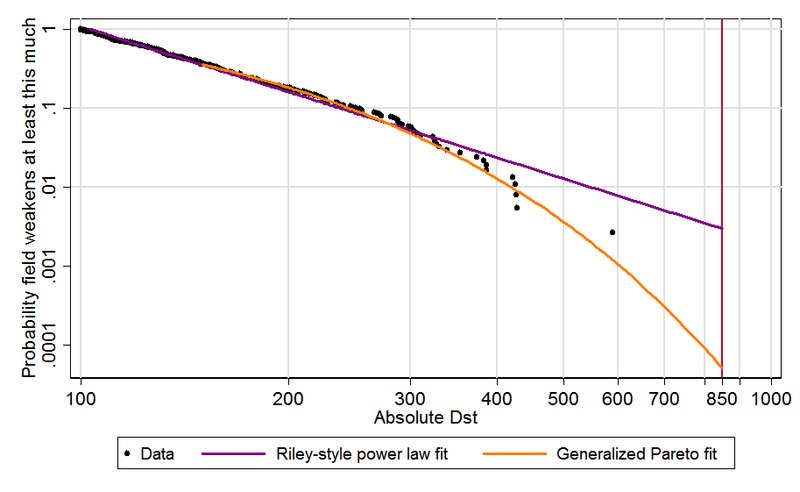 The Riley-style power law extrapolation, in purple, hits the red Carrington line at .00299559, which is to say, 0.3% of storms are Carrington-strength or worse. Since there were 373 storm events over some six decades (the data cover 1957–2014), this works out to a 17.6% chance per decade, which is in the same ballpark as Riley’s 12%. The 95% confidence interval is 9.4–31.8%/decade. In contrast, the best fit rooted in Extreme Value Theory, in orange, crosses the Carrington line at just .0000516, meaning each storm event has just a 0.005% chance of reaching that level. In per-decade terms, that is just 0.33%, with a confidence interval of 0.0–4.0%. The central estimate of 0.33%/decade does look a bit low. Notice that the rightmost dot above, for 1989, sits toward the high end of the orange bar marking the 95% confidence interval: my model views such a large event as mildly improbable over such a short time span. Moreover, if 0.33%/decade is the right number, then there was only about a 20×0.33% = 6.6% chance of Carrington-scale event in the 20 decades since the industrial revolution—and yet it happened. Nevertheless, the 95% confidence interval of of 0.0–4.0% easily embraces both big storms. I therefore feel comfortable in viewing Riley’s 12%/decade risk estimate as an unrepresentative extrapolation from history. The EVT-based estimate is better grounded in statistical theory and comes from a model that better fits the data. So are we in the clear on geomagnetic storms? As I wrote last time, I don’t think so. The historical record exploited here spans less than six decades, which is approximately nothing in the time scale of solar history. We should not assume we have seen most of what the sun can send our way. There are many limitations in this analysis. As noted in the last post, the Dst index is an imperfect proxy for the degree of rapid magnetic change at high latitudes that may most threaten grids. Though a careful estimate, 850 might be the wrong value for the Carrington event. The Generalized Pareto distribution was fit to all events above 150. This threshold was selected by examining a mean residual life plot per the procedure of Coles (2001), §4.3.1. Update, July 21, 2015: Confidence intervals are between percentiles 2.5 and 97.5 except when percentile 2.5 is 0, the theoretical floor, which becomes a mass point at high Dst values. In that case, the reported CI would really be the 0–97.5% interval, wider than intended. So then the 0–95 CI is used instead. This graph was updated on July 21, 2015 to reflect the change described in the previous footnote. 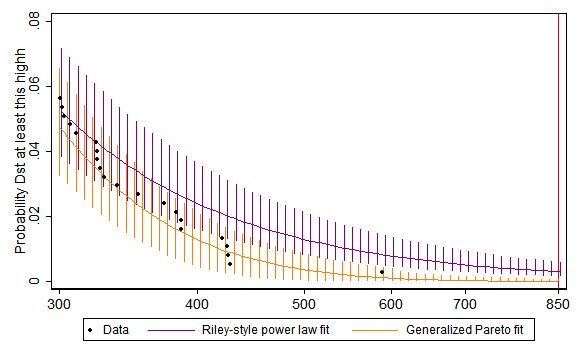 A third approach is to use a Bayesian analysis over the generalized Pareto family. A discussion can be found <a href="https://groups.google.com/forum/#!topic/stan-users/C6IxqRU1Cuw">here</a>, which gives a probability for a Carrington-scale event between the two estimates in this post (ML Pareto and ML power law). In my view, the Bayesian approach is more suitable for estimating the probability of tail events than looking at the probability under the ML (maximum likelihood) distribution (as well as the separate point that it gives a way of incorporating the possibility of Carrington without any assumptions about its frequency), but I won't (re)litigate that here.